You are here: Home / reviews / Yo Ho Ho lets go! Yo Ho Ho lets go! 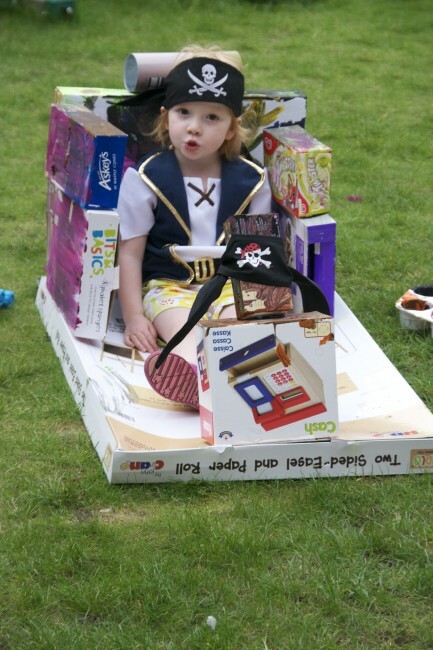 Like most children Z and S love pirates, so when we were sent these great Makedo kits the first thing they wanted to build was a pirate ship. 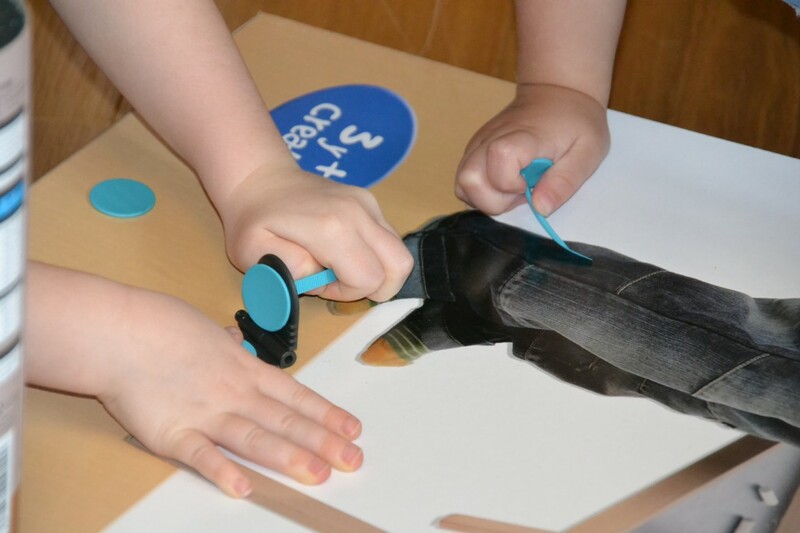 We carefully placed lots of boxes into a vague ship shape and used the special tools and connectors to fix them in place. Then we made an attempt to paint it. I feel I have to point out that my middle daughter chose her own outfit that day. I think Makedo is a great concept. The girls had great fun designing and building our pirate ship. They needed a bit of help with the connectors, but loved making the holes for me. 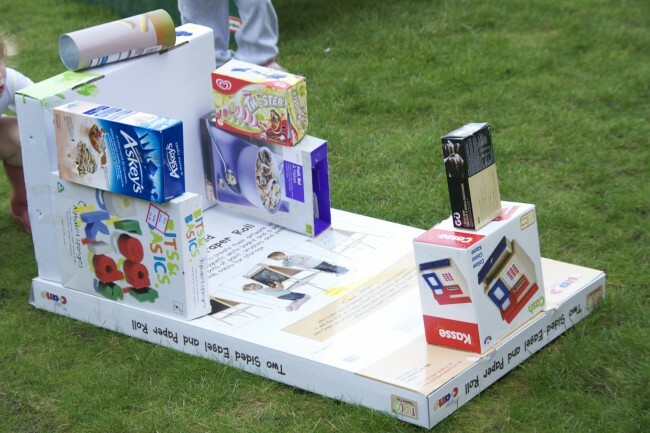 We are just waiting for some more boxes for Z to have a go. He has big plans to make a rocket. You can see the corner connectors here. Makedo is based on a very simple and reusable connector system. The system is comprised of Re-clips to connect with; Lock-hinges to hinge with; and a handy Safe-saw tool to enable kids to safely punch holes and saw through all kinds of materials. This range is designed to introduce children to the idea of using up-cyclable materials as building blocks by guiding them to make a specific creation such as a Robot, a Car, Flowers, a Dollhouse or a Playhouse. Each Find & Make kit includes Makedo’s reusable connector system, themed decorative stickers, beautifully illustrated step-by-step instructions and a gorgeous inspiration poster. The Find & Make range starts from £7.99 SRP. This range is totally open ended, limited only your imagination and perfect for all ages. 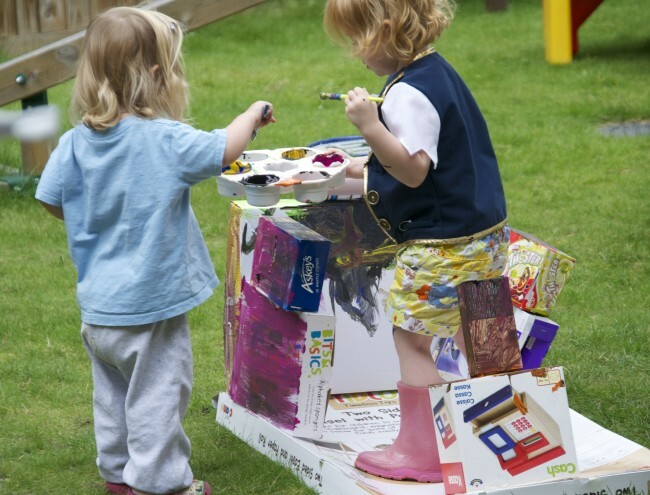 Makedo Freeplay kits are presented in a keepsake cardboard tube and are sized in individual (Kit for One) and family packs (Kit for Three) with prices starting from £11.99 SRP. These kits transform the all-familiar coffee cup into a cute collectable creature using Makedo connectors and decorative add-ons such as eyes, noses, tails and more. Transform your cup into one of six characters that include a quirky Cow, a mischievous Monkey, a funny Bunny and a hungry Hippo. Everything you need to make two delightful creatures is provided neatly within the cup. There are six different creatures to collect! Cup Critters start from £5.99 RRP each. Check out the Makedo website to see what other people have made. You can also upload your creations here to be the Makedo Maker of the Month. Looks like they had a great time playing and learning. I’ve never heard of Makedo. We might need to give it a try. We also made a pirate ship, we relied heavily on tape and pipe cleaners. I love the outfit by the way. My four year old has been dressing herself completely for preschool and there are definitely days when I have to add the “she did this herself” disclaimer. Especially on blue day when she went with the layered ragamuffin look so that she could incorporate ALL of her blue clothes. This sounds like such a cute concept. I love the pirate ship! Wow that is BRILLIANT! Go you. What a fab bit of recycling and love the plastic bit thingies you used! We have some. Must get crafty!